Welcome Spring is here at last and our favourite time of year – beer garden season – is teetering on the horizon! We’ve got loads going on to tempt the hibernators among you back to your local! There are some spectacular events in the Old Cold Store and the brewery yard and, in this issue, we’re celebrating with our renowned Yard Party. Things are all go as we put together this edition; the beers are ordered, the bands and food stalls booked, and we can’t wait for May 17th to sneak around. (Ticket sales are ahead of last year so I’d recommend getting yours online and not risking us selling out on the door.) The same goes for two events we are hosting for Nottingham’s urban radio station, Kemet FM, who’ll be bringing Boney M in to play live! The early part of the year is always spent getting our ducks in a line for the months ahead, but there have been plenty of other things keeping us busy. I was chuffed to see our debut at London’s Craft Beer Rising go down so well. Well done to our team that planned and delivered it – your efforts were certainly worth the outstanding positive feedback we received. It is reassuring to have it vindicated that our goal to balance tried and trusted brewing with new wave beers is working. I’m very proud of what our brewery team is delivering at the moment, and you’ll see more exciting beers to come on the next page. It’s also another Quarter where we can celebrate pub awards, with both the Fox and Crown and the Horse and Plough winning their respective local CAMRA Pub of the Year awards. We know this is no mean feat. It’s a real testament to the hard work, attention-to-detail and passion that our pub teams put in. Finally, I’d like to congratulate all of our Employee of the Year winners. It is always heartening to see how much our people really care about their peers and about what we all strive to do. All of it, of course, is required to deserve your patronage. We’ll never take it for granted and always keep working hard to earn it. Thanks for your support and cheers to a sunny spring! Brewer Dan Gilliland gives the lowdown on new Castle Rock beers to hit bars this spring. At the time of writing, there’s a whole other host of beers in the works too, so keep an eye on our social media feeds for updates. For now…if these won’t put a spring in your step, we don’t know what will. WINK. IPA is such a broad term nowadays. For us this iterative series is an excuse, ney a reason, to see just how much hop ﬂavour we can cram in and how to focus every other aspect of the brewing to protect, serve and amplify. In the case of IPA v3, we're looking at precisely 'a boat load' of those classic 'C' hops: Columbus, Centennial, Chinook and Citra, with careful consideration to not allow any of that pesky oxygen to spoil the fun. We brew this beer at half the brew length to effectively double the maximum hopping potential we can achieve. Big ﬂavour. SIPA v2 4.5% (Cask + keg + can) With SIPA v2, we've upped our complexity game and gone for a mixed hop bill of Galena, Citra, Simcoe and Loral in three different forms: whole cones, T90 pellets and the super concentrated cryogenically frozen lupulin powder. Orange, grapefruit, pine and juicy pineapple in abundance are matched in the ﬂavour, but kept soft on the palete for maximum drinkability. Big aromas of all the good stuff. Continuing the dry hopped cask pale series. The all New Zealand hop bill includes a bit of resinous and limey Kohatu, lots of fruity Motueka and the hen’s tooth of a hop that is Nelson Sauvin. Expect stone fruits, citrus and subtle grape juice, with a complementary pale golden malt bill. Third in the iterative fruit range comes in the form of a lychee and mandarin combo. Expect a puckering acidic breadth of juicy-sweet, palatewidening citrus from the mandarin, giving way to reﬁned and drying pear and rose notes from the lychee. Designed with an eye on the encroaching spring and summer. It's Always Honey 4.0% (Cask) Available for Mild in May Milds are making a comeback mate, I'm telling you! This one has a carefully considered malt bill to tease out notes of biscuits and nuts, all rolled up in lots of honey and allowed to get to know each other. We’ll be making sure to use responsibly-sourced British honey from a bee-friendly apiary, and keep things as local as possible. It’s Always Honey is arriving just in time for CAMRA’s Mild in May trail. SPRING Viv Anderson MBE 4.2% (Cask + keg) Available April - June Lager style beer brewed with noble hops for a savoury slightly herbal and floral character, balanced by a nice bit of DMS derived from the lager malts. DMS (Dimethyl sulphide) provides a pleasant sulphidic, almost sweetcorn-like flavour which is synonymous with the style and, when done properly, is the perfect contrast to the subtle hop profile. About Viv Anderson, MBE Nottinghamian Celebration Ale #35 Viv Anderson joins our own hall of fame this year as the 35th local person to be celebrated with a Nottinghamian Ale. Viv was born in Clifton and went on to play for various clubs in the Football League during the 1970s and 80s, including Nottingham Forest. Viv was also the first black player to play for England internationally. We are particularly excited to launch Viv Anderson's namesake beer this year as 2019 is the 40th anniversary of Nottingham Forest's European Cup win. Viv was a member of the winning squad. To celebrate, the Embankment is hosting a special ‘An Evening with...’ event on the anniversary of the cup win, May 30th. Viv will be joined by other members of the squad of '79 to talk about the tournament, and there'll be a Q&A afterwards too. Tickets are just £30, and include a £5 donation to Prostate Cancer UK, a drink and some tasty chilli, to accompany an evening of football tales. Visit our website for tickets. The Umpire Strikes Back 4.5% (Cask) Available May-June Brewed especially for the ICC Cricket World Cup 2019, with a pump clip featuring Castle Rock directors (just for fun). Crisp, refreshing and goes down like a Portuguese footballer inside the 12-yard box. ‘But this beer’s for the cricket not the football! ?’ I hear you say. Not to worry, I don’t know much about either. It is, however, built to be sessioned alongside the sun while watching those matches that play on for days. Expect subtle fruity and citrus aromas with a long drying finish mirroring those lazy summer evenings. and indulgent, and received several “beer of the festival” comments. Following this, we had Mango Milkshake, which was one of the fastest-sellers on our bar. It’s well-rounded with smooth mango at the fore, followed by a crisp and lingering finish from the mango blending with Citra and Mosaic. And finally, there was newbie IPA v2, an extremely hop-forward showcase of Ekuanot cryo hops. It’s complex, fruity, rich and full of character. Two trade sessions and four customer sessions later, and we couldn’t have been much happier with the response. Some people seem to hold an ongoing assumption that Castle Rock is some kind of behemoth, but in reality, our approach as a brewery in recent years has been understated, and we’ve undertaken a developmental approach when it comes to our production. It was enlightening that just as many people hadn’t heard of us as those who had, and furthermore that many didn’t know we brew craft keg beer. Ultimately, we were immensely proud to give the brewery some exposure in London, and equally proud to be representing Nottingham, including our friends at Liquid Light Brew Co with our collaboration beer. It was also great to catch up with industry friends and make new ones! Huge thanks to Wild Card for being kind and hospitable, Salt Beer Factory and Mothership for being lovely neighbours, and also thanks to Beigel Bake – without your 24-hour eatery we wouldn’t have made it through! Onwards and upwards, here’s hoping we can do more and more festivals in 2019. Pictured above: Castle Rock’s Carl Duke and Dan Gilliland with their mascot, Bob Ross, at Craft Beer Rising. Hi there, it’s Liv here, editor of the Castle Rock Quarter. It seems my boss Lewis slipped a little article into my content list for this edition. He entitled it “Ten Great Things About Lewis”. Clearly, he thought I’d chuckle and ignore it, but what’s the fun in that? So here we go, in no particular order: l The way you clear your throat to reach really high notes when you’re singing l Your co-dependent relationship with Dan (above) l That you’re so kind to me when nobody else is around l Your fabulous shirts l Your love of plants and small critters l The sad reality that you can’t pronounce ‘polo’ l Your unrivalled skill at reciting scenes from Harry Potter l Your unrivalled skill at reciting scenes from Matilda l That when a wasp stung me and got stuck in my arm, you came to help l That we cry with laughter together You’re welcome. The Goings On CASTLE ROCK’S ANNUAL SHINDIG Each year on a chilly January day, Castle Rockians gather at the brewery for a good old knees-up. For one day only, we close all our managed pubs and come together to celebrate with a Christmas Party, New Year’s celebration and team bonding day rolled into one. Thanks to the efforts of Sarah Halpin, this year involved enough inﬂatable assault courses to rival the Gladiators, street food and a DJ. Employee of the Year awards were given to a staff member from each pub and/or department, voted for by their peers. MD’s Merits were awarded to Neil Harrison, our longestserving brewery team member, and Pete McWilliam, who heads up our logistics and green initiatives, and has worked for Castle Rock for 18 years. The Chris Holmes Award (named after our founder) went to Barley Twist manager Dave James, as voted for by his fellow pub managers. Thank you for managing without us for a day, and for all your messages of support and thanks. NB: A special mention must go to our Operations Director Vicki, who broke three fingers in her admirable commitment to the assault course and led the pink team to victory. NEW RELEASE NIGHTS We recently kicked off a series of brand-new events at the Old Cold Store (next to the Vat and Fiddle). New Release Nights are a chance for you to try our freshest, newest beers before they go out to the pubs, and an opportunity to meet our brewers, sales reps, managers and friends. This spring kicked off with two amazing awards for two of our lovely pubs... Newark CAMRA announced their Cider Pub of the Year and Pub of the Year, and both accolades went to the Fox and Crown! Then, before a date was even set for the awards night, the Horse and Plough in Bingham was crowned Pub of the Year by Belvoir CAMRA! Our ﬁrst New Release Night saw over 80 people pile into the Old Cold Store to try four of our newest beers: IPA v2 (hop-forward IPA), Fruit v2 (guava, mango and passion fruit pale), Lightspeed Spacerock (chocolate salted caramel stout, a collab with Liquid Light) and Computer World (single hop Simcoe dry hop pale ale). All but Computer World was offered in both cask and keg so our visitors could compare and contrast – a celebration of both forms of dispense and their own complexities. Needless to say, we are incredibly proud of both pub teams, and the pleasure was all ours to attend the award-giving and celebration night at the Fox. The turnout was brilliant, with live music aiding a great atmosphere, and a cake baked especially for the night stood out a treat amongst the buffet. At the time of writing, the date hasn’t been set for the awards night at the Horse and Plough, but you can bet we’re looking forward to another evening of fun, food, and a chance to raise our drinks to the pub team for their excellent work. What ensued was a wonderful atmosphere as everyone came together to talk about not just our new beers, but beers in general (and the local scene in particular). It was a heartening coming-together of our favourite people. The hugest congratulations to all of you. We’ll be sure to keep you updated on future events! With everything we do, constructive feedback from our broad customer base is genuinely valued, so that’s why we’re committing to holding a New Release Night for every new beer, giving you plenty of reasons to head out for a teatime drink. A TRIBUTE TO HELEN We paid tribute to suffragette Helen Watts, with the unveiling of a memorial plaque in the Nottingham Arboretum. Back in April 2018, we brewed a Nottinghamian Celebration Ale for Helen Kirkpatrick Watts, Nottingham’s best-known suffragette. Watts, raised in Lenton, rose through the ranks of the suffragette movement thanks to her pragmatic and inspiring speeches. She was arrested three times and imprisoned twice before the age of 30, and her second incarceration saw Watts go on hunger strike for 90 hours, though it’s believed she avoided forcefeeding. Shortly after the last Castle Rock Quarter went to print, we gathered in Nottingham’s Arboretum with members of the Watts family, both the Sheriff and Counsellor of Nottingham, and the Nottingham Women’s History Group. It was 14th December, 100 years to the day since some women were able to vote for the ﬁrst time, and we marked the occasion by unveiling a memorial plaque, next to a juniper tree planted in her memory. The beer may be long gone now, but Helen Watts’ memory is set in stone. We hope that people will remember all she and her contemporaries did for us, and will continue to strive for equality for everyone. There’s still plenty to be done. THE TALE OF THE HUMBLE PUB CRAWL AND THE LONG-LOST COUSINS In January, we organised a pub tour to celebrate the launch of our ﬁrst Nottinghamian beer of 2019. The milk stout with coffee was named in honour of Arthur Skill, whose enterprise (founded 100 years ago) has grown into Skills Holidays, one of the region’s largest tour companies. On a frosty winter morning, a Skills coach picked up 57 customers and beer fans for a mini-Castle Rock pub crawl. We re-created the original Skills route to Derby, stopping off ﬁrst at the Alexandra Hotel, before scooting down to the Swan in the Rushes in Loughborough, over to the Horse and Plough in Bingham, and ﬁnally back to the Embankment on Trent Bridge. At each stop, we sampled Arthur’s tipple in celebration of the remarkable young entrepreneur and his achievements. What we didn’t expect was for our humble pub crawl to reunite members of the Skill family. For the Nottingham-based family members, Arthur Skill was their great grandfather, while he was a great uncle to the Derby side. They turned up to surprise Rupert, Arthur’s great grandson, and the group re-connected after many years. A big thank you to everyone who joined us on the crawl and who enjoyed a pint of Arthur’s namesake beer, and our best wishes to the Skill family. no matter what background to enjoy a drink, and although you may not speak to those people directly, everybody is aware of each other’s presence, and collectively we all create an atmosphere like no other. It’s a place where somebody knows your name, where bar staff know you on a personal level, know what you will order, and other beers you might like. It’s a place that keeps friendships alive, when you haven’t seen that friend in years and you need to loosen up, act lively and embrace the time you have. It’s a place that allows you to try new tastes, beautifully crafted and created by local brewers with families to support, who wouldn’t be able to support them or continue doing what they love – making beer – without you as a customer. It’s a place that, after the cold winter months and the blues of Christmas, I turn to. It’s a place I need to be open in January, and every other month of the year. MEET (SOME OF) THE TEAM NAME: ROSIE ROLE: Manager at the Fox and Crown YEARS AT CASTLE ROCK: 8 Likes: Cask ale, pub crawls, horror ﬁlms. Dislikes: Laziness. What’s your favourite thing about your job? I love my pub so much! Making it the best it can be gives me incredible job satisfaction. Drink of choice: I can’t choose a favourite beer! I’m enjoying SIPA v1 at the moment, but I do think I could happily drink Northern Monk’s ‘Striding Edge’ forever. What’s your background? I worked in retail before working here, and have some experience in sales too. Who’s your idol? Britney Spears. The strength she displayed to overcome her mental health issues is really inspiring. Plus, who doesn’t love Toxic? Where’s your favourite place? The Spa at Centre Parcs. What do you like to do outside of work? Visiting different cities with my ﬁancé for pub crawls, watching horror ﬁlms and going to the seaside. What’s your favourite quote or saying? Life is what happens when you’re busy making other plans. What guilty pleasure would we find on your music playlist? Probably the Spice Girls. That’s what I play in the cellar at work when I’m scrubbing the ﬂoor! Which quality do you value most in others? Reliability. What’s your biggest fear? The zombie apocalypse? What’s your favourite book, film or podcast? Book is George Orwell’s 1984. Film is Jackie Brown. Any nicknames? Nope. Tell us one thing left on your bucket list? I am getting married in May, so that’s one big one! What would your super power be? To be able to stop time, just like in Bernard’s Watch. Give us one word to describe you: Busy. NAME: PETE HOPWELL ROLE: Head buyer and business development manager YEARS AT CASTLE ROCK: 5 .5 Likes: The wife and my boys. Food, drink, music and Derby County. Dislikes: Ignorance. What’s your favourite thing about your job? Negotiating, mentoring and trying samples! Drink of choice: Screech Owl. What’s your background? I have worked in the industry for 30 years. I started as bar staff at the age of 18, fell in love with pubs and worked my way up the ladder. Eventually that led me to ﬁnding the Castle Rock family and carving a career that is different every day and allows me to work with some great, inspiring people. Who’s your idol? No real idol, but I do idolise my two boys. Where’s your favourite place? Ibiza. What do you like to do outside of work? Date nights, watching my boys play football on Sundays followed by a homemade roast, going to gigs, and watching Derby County (although the latter can be painful). What’s your favourite quote or saying? Solution-orientated, not problem-centred. What guilty pleasure would we find on your music playlist? I have a very eclectic playlist, but I reckon my guilty pleasure would be the Pet Shop Boys. Which quality do you value most in others? Common sense and honesty. What’s your biggest fear? Wasps. What’s your favourite book, film or podcast? Film is Shaun of the Dead. Not really a podcast but I love the Chris Moyles Show. Any nicknames? None to my face, except Vicki Saxby (the boss) calls me the Hopster! Tell us one thing left on your bucket list? To attend the Burning Man Festival. What would your super power be? Sarcasm. Give us one word to describe you: Happy. BEER TOP PICKS Wayne Harvey, Castle Rock’s beer guru and manager of craft haven the Canalhouse, picks his top beer choices for April, May and June 2019. BET THE FARM, Duration, 4.5% Bates and Miranda, the pair behind Duration, are working towards creating a ‘UK destination farmhouse brewery’ in Norfolk. Their aim is to bring modern technologies back to the farm; to revive old traditions but with improved efficiency and less waste. It’s a project on a huge scale, which includes renovating a farmhouse and building a taproom and visitor centre. They have quickly made a name for themselves, collaborating with Cloudwater and Brixton among others while they work on making their dream a reality. Bet the Farm (and their other beers) are currently being brewed in Norway at Amundsen Bryggeri. Bet the Farm is Miranda’s beer, created to reﬂect her personality as well as what’s in store once the brewery is up and running. It’s a hoppy pale at 4.5%, brewed with Magnum (for bitterness), Tettnang (for aroma) and Mandarina Bavaria (for ﬂavour). There’s some zesty lemon in the aroma and a well-balanced ﬂavour – crisp and dry with a refreshing bitterness. A great beer as the days warm up. DREAMCATCHER, Turning Point, 10% Turning Point Brew Co is based up in Kirkbymoorside, just north of York and bordering the North York moors. It’s a 12BBL brewery which uses a fresh water well directly under the brewery, supplied from the moors. The head brewers describe Dreamcatcher as ‘that time we poured two tonnes of dates from the door of a stunt plane into a chocolate river ﬂowing through a vineyard in Sicily’, which seems about right. It’s an imperial stout aged in bourbon and marsala barrels for a year, and then blended together. Chocolatey, rich, warming and very boozy at 10% ABV. DRINK’IN THE SUN, Mikkeller, 0.3% It’s about time I included an alcohol free (0.3% ABV) beer in my top picks and Mikkeller has nailed this one. Founder Mikkel Borg Bjergsø has gained a bit of a cult-like status; the former maths and physics teacher has never owned his own brewery but is always brewing and collaborating with some of the world’s best breweries. Drink’in the Sun is an American-style wheat beer brewed at D’Proef in Belgium, and has all the characteristics you want in a summery beverage. It pours a hazy pale amber with juicy aromas of tropical fruits, and citrusy ﬂavours including a refreshing hint of pineapple. Mikkeller say they add actual sunshine to the recipe – I’m inclined to believe them. CIDER TOP PICKS Castle Rock’s Cider Guru Rachel Hopwell gives us her top picks for the spring season, and for the last time! Without further ado…over to you, Rach, and a big thanks from all of us. MARMALADE, Seacider 4% ABV The guy behind SeaCider, Mark Francis, started out as a brewer in sunny Brighton, when he spotted an abundance of apple orchards that weren’t being harvested. While touring around Sussex delivering his beer, he also realised that most pubs didn’t stock local cider and figured that was because there weren’t many real cider makers knocking around anymore. Marmalade is one of the best tasting ciders I’ve tried in quite a while. It’s not surprising then, that SeaCider also took home our Castle Rock Cider Producer of the Year Award. Made with Seville oranges, you really get that marmalade taste – slightly bitter and slightly sweet with a tang. Very drinkable and perfect for the warm days at a sessionable 4%. To add to the seaside charm of SeaCider, Mark also makes sure to use apples that have been rejected from supermarket chains for being the wrong colour, size or shape. their cider is still made on the home farm, its now pouring in seven countries. Gwynt Y Ddraig is deﬁnitely a trustworthy name to start with if you’re new to real cider. Black Dragon especially has gained quite a following among the most discerning cider drinkers. It’s a special reserve cider made with a secret recipe, so there’s not much I can tell you about the process behind producing it. But I can say it’s got plenty of body, a fresh and fruity aroma, and rich apple ﬂavours. It’s also suitable for veggies, vegans and coeliacs, so that’s a win. RED LOVE, Biddenden 5% ABV Biddenden is a family vineyard based in Kent, with the second and third generations of the family currently running the show. The Barnes family diversified their farm in the late 60s, after Mrs Barnes heard a BBC Woman’s Hour programme about English vineyards being replanted. This cider is a bit different, being Britain’s ﬁrst naturally red cider. The name comes from the red-skinned and ﬂeshed apple used in production, though the cider itself can have a pink-hue. There’s a fresh, sharp apple aroma, a moderate amount of sweetness and some nice sourness too. I’d recommend giving their wines and juices a go as well. And a bye from me! I’m sad to say this will be my last Top Picks! I’m hanging up my Cider Guru hat so I can crack on with other projects, but I’ve loved the opportunity. I hope my fellow cider fans have found some new favourites in this column. It’s been a blast, thanks for reading! ‘Most Underwhelming Performance’. (The Poacher team is involved in the tournament every year, and it was their turn to host.) The guy turns out to be Alex Young, a founding member of the Poacher cricket team, which is made up primarily of customers and former staff. ‘The goal was to actually get us out of the pub sometimes. But we’re very inclusive, everyone is welcome to play,’ he says. Most recently, the Poacher cricket team took to the Forest Recreation Ground in Nottingham for a charity game, followed by a BBQ and drinks back at the Poacher. The day managed to raise £1,100 for Maggie’s Nottingham, which provides free practical and emotional support to people with cancer and their families. value each other should continue to work together, build great things and enjoy the journey. And when we do let you down, or we do mess up, we’ll do everything we can to make it up to you. Sometimes though, we should all say something when a business gets it right. In our office alone, enough stressful days have been boosted by coming across a positive review. It means even more to our managers and pub teams, who are often thanked personally. We couldn’t be more appreciative of every customer who has taken the time out of their day, just to say they enjoyed their visit to one of our pubs. And to round my moanings musings up, I’ll just say this: For the handful who mess up, who lie or cheat a system put in place to empower the consumer, shame on them. For the rest of us, we’ll keep keeping it classy. We’ll be here, being honest, trying our best, and focussing on the good eggs we’ve found in one another. Nottingham Poetry Festival is back for 2019 and will once again shine a spotlight on the city’s thriving literary scene. Stephan Thomas, Bridie Squires and Georgina Wilding, three Notts’ poets at the Old Cold Store during Nottingham Poetry Festival 2018. This year, Nottingham’s ﬁrst Young Poet Laureate Georgina Wilding (founder of Mud Press) is Creative Director for the festival, and is leading the ten days of word jams, poetry slams, performances, songs and readings. Georgina has been commissioned by organisations such as the Royal Shakespeare Company and BBC Radio Nottingham and has performed along names including Poet Laureate Carol Ann Duffy. Under her stewardship, we’re sure the Nottingham Poetry Festival 2019 will be the most vibrant and exciting yet. including some of the most renowned poets from across the country. Names on the line-up include Ian McMillan (journalist, playwright, broadcaster and regular judge of poetry competitions), poet and playwright Caroline Bird (shortlisted for more poetry awards than we can keep track of), 31-year-old prodigy Andrew McMillan (who wrote the ﬁrst poetry collection to win the Guardian’s First Book Award) and Patience Agbabi (the nearly-always-touring poet whose ground-breaking debut won the Excelle Literary Award), among tens of others. We’ve been involved in the festival since its inception three years ago, and it’s been incredible to watch it grow year on year. Back in 2017, we celebrated the life and works of Henry Normal – Nottingham-born poet, comedian, tv producer and writer – with a Nottinghamian Celebration Ale. Quickly hitting it off with Henry, we were excited to hear about his plans for the Nottingham Poetry Festival and decided to back him all the way! So, ever since, we’ve been lovingly welcomed into the bosom of the literary community in Nottingham. We’ll be hosting some Nottingham Poetry Festival events in our own city centre pubs, including hosting the launch night at the Fox & Grapes in Sneinton Market. Visit the Nottingham Poetry Fest website for the full event calendar, or swing by ours for the details of events at your Castle Rock local. Don’t let the Nottingham Poetry Festival pass you by. It is a wonderful celebration of the written (and spoken) word in a UNESCO City of Literature; a dynamic, inclusive and thriving showcase of talent. MON 13th-SAT 18th MAY @ Fox & Grapes – Poppy and Pint Stratford Haven – The Swan in the Rushes If American craft beer is your thing, you’ll want to ﬁnd your way around these pubs this week. American craft takes over the taps (paired with some great tasting American food at the Swan, too). Don’t miss the Fox & Grapes’ New York Brewers Showcase either – with beers exclusively from the Big Apple. EASTER WEEKEND FRI 19th-MON 22nd APRIL @ Stratford Haven – Fox and Crown Swan in the Rushes The Strat and the Fox both have special Sunday menus for Easter weekend to tuck into – make sure you contact them to pre-book. Or, for something more relaxed but equally tasty, pop into the Swan in the Rushes anytime over the weekend to enjoy chocolate porters and stouts in cask, keg and can. May MILD IN MAY AND CIDER SEASON ALL MONTH @ Various Castle Rock pubs, visit our website for full info There really is something for everyone this May, with CAMRA encouraging people along the mild trail and reminding us all that new batches of cider are ready. As always, Castle Rock pubs are signed up to be part of the Mild Trail, which will include our newbie brew It’s Always Honey. The Fox and Crown and the Strat will both be celebrating cider month with cidertasting evenings on 2nd May, for a chance to meet the cidermakers from Blue Barrel and the Bottle Kicking Cider Company. Meanwhile, the Lincolnshire Poacher has an extended cider range with at least 15 available at any one time, including ﬁve from local producers, and over at Yarn there’s 50p off all real cider all month long. 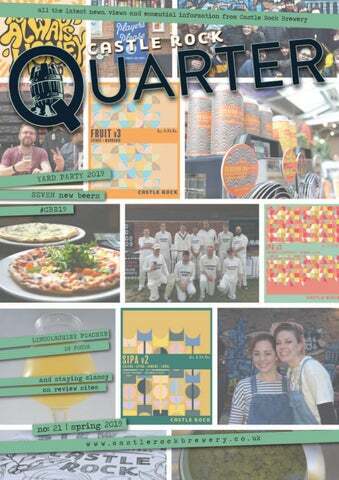 CASTLE ROCK YARD PARTY FRI 17th and SAT 18th MAY @ Castle Rock Brewery Sorry (not sorry) to bang on about it, but this quarter it’s our Yard Party. What are you waiting for? Tickets are selling, beers are arriving, bands are booked, street food vendors are prepping their menus, and we’re all getting in 40 winks while we still can. Head to gigantic.com to book your tickets now… PLUS…The Castle Rock Comedy Club launches at the Yard Party on Saturday 18th May, brought to you by the Old Cold Store. The Comedy Corner will be showcasing all kinds of comedians for its launch event (just in case you needed another reason to come to the Yard Party). The Castle Rock Comedy Club is here to stay, with side-splitting comedians brought directly to our brewery tap on a regular basis. There are another two lined up for the quarter, so be sure to check our website for details. WORLD WHISKY DAY (& FA CUP FINAL) SAT 18th MAY @ Kean’s Head – Lincolnshire Poacher Poppy and Pint – The Swan in the Rushes World Whisky Day is the perfect chance to enjoy your favourite or try something new, with all these pubs offering discounts on the good stuff. Check our What’s On page on our website to see where you can also catch the FA Cup ﬁnal. CRICKET WORLD CUP THU 30th MAY-FRI 14th JUNE @ The Embankment – Poppy and Pint Stratford Haven – Vat and Fiddle As cricket fans everywhere anticipate the ODIs and then the World Cup, the Embankment and Stratford Haven are preparing a for a few early starts – both pubs will be ready and waiting with their famous breakfasts on Trent Bridge match days. The Strat will also have an outside bar and a BBQ going, while the Poppy and Pint and Vat and Fiddle can promise an amazing match-day atmosphere. Not to mention a little something special we’ve got brewing for the occasion, too. June FISH AND CHIP DAY FRI 7th JUNE @ Kean’s Head – Poppy and Pint – Yarn There’s something ﬁshy on the menu at these pubs today – better get your mac and sunnies on and go check it out. NOTTINGHAM CRAFT BEER WEEK SUN 9th-SUN 16th JUNE @ Various Castle Rock pubs Okay, there’s A LOT going on this week and we don’t stand a chance packing this into one listing. There will be tap takeovers, meet the brewers, new beers from us (wahey) and of course Nottingham Craft Beer Week Festival in Sneinton Market. Let’s be honest, the only option you have is to book the week off and hope for the best. 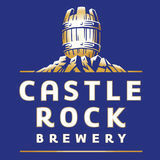 Visit www.castlerockbrewery.co.uk/NCBW for the full listings. FATHER’S DAY SUN 16th JUNE @ Bread and Bitter – Fox and Crown Poppy and Pint Treat Dad to a trip to his favourite place…his local pub! You really can’t beat a decent meal, excellent beer and some quality time with Dad. Pre-booking is advised. What’s On (Spring #21 Jun-July) June (cont.) ANNUAL SUMMER BEERFEST THU 27th-SUN 30th JUNE @ Golden Eagle If you want a weekend of music, BBQs and a smashing selection of beers in a beautiful pub garden, look no further. The Golden Eagle’s got the whole family covered, and entry is free. July We know these are technically next quarter, but why miss out for a technicality? Tickets are selling fast for both these events so be sure to nab yours in the nick of time. ABBEYDALE COACH TRIP SUN 28th JULY @ Fox and Crown Join the Fox and Crown team on their day out to Sheffield! Tickets include a tour around Abbeydale Brewery and a visit to the New Barrack Tavern, our CRB pub in Sheffield. Lunch at the pub is included in the price and tickets are available from behind the bar at the Fox – ring to reserve yours. This spring and summer… BEE-FRIENDLY GARDENS Look out for wild and bee friendly ﬂowers, and the fuzzy buzzy things that come along with them. This spring we’re making a conscious effort to increase the biodiversity in our pub gardens and welcoming honey bees, bumble bees, and nonconformist bees alike to be our guests this season. Offers and deals for a weekday night out under a tenner! (T&Cs apply to all.) This is only a small handful of our offers – check the website for more. All of our pubs follow the latest allergen legislation. Further details are available in each establishment. Lady Bay Inns: operators of the Poppy and Pint / The Beer Consortium Ltd.: operators of the Barley Twist, Cricketers Rest, the Embankment, Fox & Grapes and Horse and Plough / Breakthrough Point Ltd.: operators of the Canalhouse. All of our pubs follow the latest allergen legislation. Further details are available in each establishment.